C-Suite Fitness is the latest business venture for personal trainer Brendon Parks. Based in Albany, New York, Brendon decided to shift gears in the fall of 2015 to go from co-owning several locations of a personal training gym as a partner, to opening and operating his own luxury fitness studio. 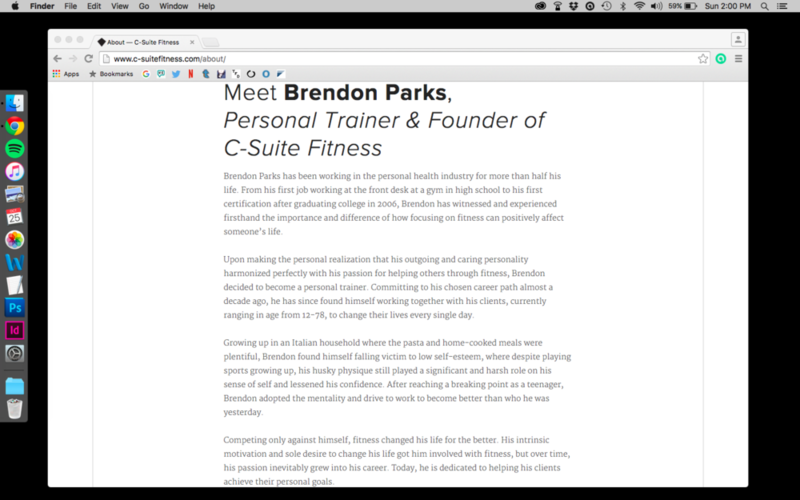 For this project, I worked exclusively alongside Brendon, in order to come up with a comprehensive brand concept for his company, aptly named C-Suite Fitness, and was responsible for original logo design, website creation and organization through Squarespace and producing and editing all the written copy on the site. Created in Fall 2015. Bio for personal trainer Tiffany Tatlock. Please take a look around C-Suite Fitness to see more!